C3 has invited people of all ages – “artists” and “non-artists” alike to submit two-dimensional (2D) and three-dimensional (3D) art that will sell for no more than $15 per piece. All unframed 2D art will be hung on clotheslines in the gallery space, while framed 2D work and 3D work will be displayed on tables. 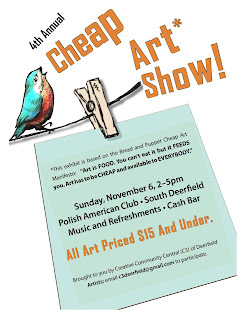 The Cheap Art Show is great fun, has a fabulous turn out, and is a great example of how art can be more accessible - even for just a day - for those with limited means or no room in the budget for higher price tags of art. Artists who participate often sell prints of their art, or seconds, or take the opportunity to move old pieces out of their studio, or just want to make art more affordable for the day. Other times the art is sold by younger artists - kids and teens - who are talented and want a chance to see what it's like to exhibit and sell their art. Visitors to the show will be able to come in, see the work, take work off the line or table to purchase, and take that work home with them. There will also be food and a cash bar.